Purpose: Although acute bouts of exercise reportedly have beneficial effects on executive function, inactive people may find it difficult to start exercising. In this study, we focused on housework activities (HAs) that generate a sense of accomplishment and require a mild intensity of physical activity. We examined the impact of an acute bout of HA on executive function and oxygenated hemoglobin (oxy-Hb) flow to related cortical regions. Materials and methods: Twenty-five participants (age, 18–21 years; mean, 19.88±0.60 years; six males and 19 females) underwent two experiments, ie, HA and control experiments, which were conducted on different days. Participants vacuumed a dirty floor in the HA experiment and mimicked the same motion with an unplugged vacuum cleaner on a clean floor in the control experiment. Results: Heart rate recorded during the experiments showed no significant difference in the intensity of physical activity between control and HA groups. A questionnaire revealed a sense of accomplishment after completing the HA experiment. 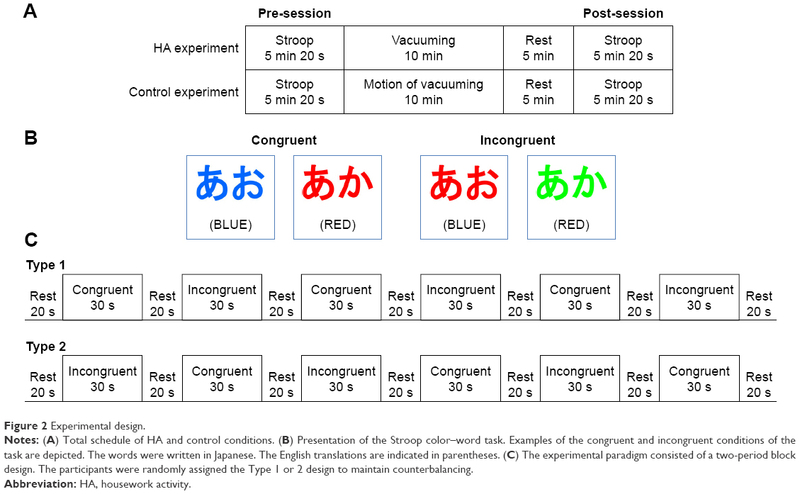 Participants performed the Stroop color–word task (SCWT) pre- and post-experiments; cortical hemodynamic changes were simultaneously monitored using functional near-infrared spectroscopy. Variation in Stroop interference scores for SCWT total response between pre- and post-experiments was significantly higher in the HA group than in the control group, and that for SCWT correct response showed a similar trend. Variation in the Stroop interference score for oxy-Hb flow to the right ventrolateral prefrontal cortex (R-VLPFC) showed the same trend. Conclusion: Thus, HAs may have a greater beneficial effect on executive function than other physical activities through the activation of PFC, including R-VLPFC. Nevertheless, it is unclear if acute bouts of HA can affect executive performance and if there are differences in the effects of HA and physical activity on executive function. Here, using fNIRS, we hypothesized that HA has a larger effect on executive function and cortical activation than physical activity. Twenty-seven healthy university students participated in this study. All the subjects were native Japanese speakers and confirmed to be right-handed using the Edinburgh Inventory.22 Data from two participants were excluded from the analysis because they did not fulfill the experiment requirements (ie, misunderstanding SCWT or a performance outside the range of ±2 SD). The results for the remaining 25 participants were included (age range, 18–21 years; 19.88±0.60 years, mean ± SD; six males and 19 females). All participants provided written informed consent. The present study was approved by the Institutional Review Board of Gunma University (number 27-12). We compared the effects of two experiments: HA and control. The protocols of this study have been deposited at protocols.io (doi: http://dx.doi.org/10.17504/protocols.io.jatcien). HA and control experiments were conducted on different days in a randomized order. Both experiments utilized a vacuum cleaner (MC-L51P 500 CANISTER; Panasonic Corporation, Osaka, Japan). The HA experiment included vacuuming a dirty floor. There were shredded paper (total, 8 g) and plastic balls with a diameter of 6 mm (total, 100 balls) on the floor within an area of 2.2×1.8 m (Figure 1A). Participants were instructed to vacuum the floor as much as possible in 10 min, including preparing (retrieve the vacuum cleaner and plug in the cord) and returning the vacuum cleaner (unplug the cord and return the vacuum cleaner). To control for the cognitive workload that vacuuming provides, we provided the same instructions and execution contents (procedure, range, and amount) to all participants. After the HA experiment, participants were asked to grade their level of sense of accomplishment based on a 5-point Likert scale with following labels: 5= Very much, 4= Quite a lot, 3= Moderate, 2= A little, and 1= Not at all. 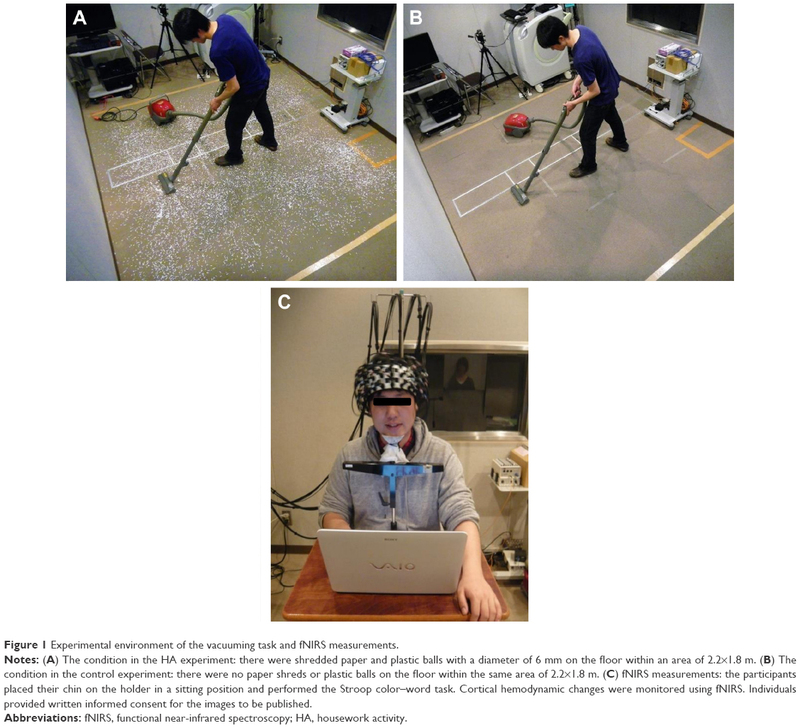 Figure 1 Experimental environment of the vacuuming task and fNIRS measurements. Notes: (A) The condition in the HA experiment: there were shredded paper and plastic balls with a diameter of 6 mm on the floor within an area of 2.2×1.8 m. (B) The condition in the control experiment: there were no paper shreds or plastic balls on the floor within the same area of 2.2×1.8 m. (C) fNIRS measurements: the participants placed their chin on the holder in a sitting position and performed the Stroop color–word task. Cortical hemodynamic changes were monitored using fNIRS. Individuals provided written informed consent for the images to be published. Abbreviations: fNIRS, functional near-infrared spectroscopy; HA, housework activity. The control experiment required participants to perform the motion of vacuuming a clean floor as a physical activity task. There were no shredded paper or plastic balls on the floor within an area of 2.2×1.8 m (Figure 1B). Participants were instructed to imitate the motion of vacuuming for 10 min, including retrieving the unplugged vacuum cleaner and returning it without the unplugging action. To determine the intensity of physical activities in both experiments, the heart rate (HR) was recorded every 2 min during the task. The basal HR23 was measured in a supine position on a different day. The analysis of physical activity intensity for the control and HA groups was calculated based on HR using the Karvonen Formula.24 Intensities of the control and HA groups were compared using a paired t-test. Data were analyzed using the Japanese version of SPSS Statistics for Windows version 20.0 (IBM Corporation, Armonk, NY, USA). The level of significance was set at p<0.05. Subjects performed SCWT in which the same words/colors were used for both pre- and post-experimental testing. During SCWT, changes in cortical hemodynamics were monitored using fNIRS (Figure 1C). The post-experimental SCWT was performed 5 min after the experiment (Figure 2A). According to a previous report,25 we used the incongruent (eg, the word “BLUE” printed in red ink) and congruent (eg, the word “BLUE” printed in blue ink) conditions of SCWT (Figure 2B). SCWT displayed the name of a color and required subjects to verbally state the color of the text. After the participants answered, they pressed the “Enter” key to advance to the next screen. The investigator recorded the number of correct and incorrect responses. Participants answered as many questions as they could within 30 s; consequently, the number of trials presented per block depended on the participant’s response speed. Notes: (A) Total schedule of HA and control conditions. (B) Presentation of the Stroop color–word task. Examples of the congruent and incongruent conditions of the task are depicted. The words were written in Japanese. The English translations are indicated in parentheses. (C) The experimental paradigm consisted of a two-period block design. The participants were randomly assigned the Type 1 or 2 design to maintain counterbalancing. SCWT was performed in a periodic block design with three congruent and incongruent blocks (30 s each) and seven resting segments (20 s each) (Figure 2C). The beginning of the test with either a congruent or incongruent block was counterbalanced using a random number table. Contents of the three congruent and incongruent tasks were completely different and randomized each time. Before conducting the experiments, the participants were first provided an explanation regarding SCWT, followed by a trial of ten rounds of SCWT (six rounds of congruent and four rounds of incongruent conditions). To confirm the Stroop effect, we conducted a repeated-measures three-way ANOVA with the following factors: task (incongruent and congruent conditions), experiment (HA and control), and session (pre- and post-). This analysis was conducted for the total number, overall correct responses, and the error rate. To calculate the Stroop interference score during SCWT, we subtracted the number of responses in the congruent condition from that in the incongruent condition. Differences between HA and control experiments for Stroop interference scores were analyzed using a repeated-measures ANOVA, with the experiment (HA/control) and session (pre/post) as within-subject factors. Post hoc analysis was conducted with Bonferroni correction. When we detected an interaction between the experiment and session, we calculated the variation in the Stroop interference score between post- and pre-sessions for each experiment. A paired t-test was used for comparisons of the variation in the Stroop interference score between the HA and control groups. Data were analyzed using the Japanese version of SPSS Statistics for Windows version 20.0. The level of significance was set at p<0.05 and trend toward significance was set at p<0.1. Cortical activation was detected using an fNIRS system (LABNIRS, Shimadzu Corp., Kyoto, Japan). This system is based on the modified Beer–Lambert law26 and used 780, 805, and 830 nm continuous near-infrared light. Relative oxygenated hemoglobin (oxy-Hb), deoxygenated hemoglobin (deoxy-Hb), and total hemoglobin (total-Hb) signal changes were measured by the optodes. From the fNIRS measurements, we used the oxy-Hb which was the most sensitive indicator.27 The sensitivity of fNIRS to detect spatially specific activations during the performance of executive tasks was supported using functional magnetic resonance imaging28–30 and positron emission tomography studies31 that investigated frontal cortex activation with the Stroop effect. Thus, we converted the oxy-Hb signal to a numerical value (cM-mm) for statistical analyses. In addition, we performed a baseline correlation using LABNIRS prior to the analysis. Before the initiation of the task period, the optional data range area, with points of 0 and 5.0 s for the rest period, was set as the baseline. Figure 3 The positions of the fNIRS channels. Notes: Red shows the frontopolar prefrontal cortex. Blue shows the dorsolateral prefrontal cortex. Green shows the ventrolateral prefrontal cortex. Abbreviation: fNIRS, functional near-infrared spectroscopy. First, to calculate the Stroop interference score for oxy-Hb signals, we subtracted the cortical hemodynamic changes during the congruent condition from that during the incongruent condition. Second, for a region-wide data comparison, we integrated values of channels for each ROI. Differences between the HA and control groups for the Stroop interference score for oxy-Hb signals were analyzed using a repeated-measures ANOVA with experiment (HA/control) and session (pre/post) as the within-subject factors. Post hoc analysis for “between experiments” and “within sessions” was conducted with Bonferroni correction. Since we detected an interaction between the experiment and session, the variation in the Stroop interference score for oxy-Hb signals between post- and pre-sessions for each experiment was calculated. A paired t-test was used to compare the variation in the Stroop interference score for oxy-Hb signals between the HA and control experiments. Data were analyzed using the Japanese version of SPSS Statistics for Windows version 20.0. The level of significance was set at p<0.05 and trend toward significance was set at p<0.1. On the 5-point Likert scale for a sense of accomplishment, two (8%), ten (40%), nine (36%), four (16%), and zero (0%) participants answered 5= Very much, 4= Quite a lot, 3= Moderate, 2= A little, 1= Not at all, respectively. HR during the control and HA task was 92.47±12.15 and 93.47±11.45, respectively. There was no significant difference in the intensity of physical activity between experiments [(p=0.439); 19.35±7.89 (% HR reserve; %HRR) during the control experiment versus 20.47±7.86 (%HRR) during the HA experiment]. A three-way ANOVA of the number of total responses revealed significant main effects of the task [F(1, 24) =36.185, p<0.001] and session [F(1, 24) =39.385, p<0.001]; however, the main effect of experiment [F(1, 24) =1.426, p=0.244] was not significant (Figure 4A). With regard to interaction, there was significant interaction among experiment, session, and task [F(1, 24) =4.709, p=0.040], between session and task [F(1, 24) =9.076, p=0.006], and between experiment and session [F(1, 24) =5.389, p=0.029]. No significant interaction was detected between experiment and task [F(1, 24) =1.449, p=0.240]. An analysis using the number of correct responses indicated similar results, although the interaction among the three factors trended toward significance [F(1, 24) =3.496, p=0.074]. Figure 4 Results of the Stroop color–word task. Notes: (A) The comparison of the number for total responses between the congruent and incongruent tasks. (B) The comparison of the error rate between the congruent and incongruent tasks. (C) The Stroop interference score for total responses. We subtracted the number for total responses during the congruent condition from those during the incongruent condition. (D) The variation in the Stroop interference score between post- and pre-sessions for total responses. ***p<0.001; **p<0.05. The main effects of the task [F(1, 24) =21.408, p<0.001] and session [F(1, 24) =7.681, p=0.011] on the error rate were significant; however, the main effect of the experiment on the error rate [F(1, 24) =8.330, p=0.370] was not significant (Figure 4B). There were no significant interactions among all factors [F(1, 24) =0.001, p=0.981], between session and task [F(1, 24) =1.958, p=0.175], between experiment and session [F(1, 24) =0.193, p=0.664], and between experiment and task [F(1, 24) =0.117, p=0.736]. Stroop interference scores for the total response in the HA experiment were −2.36±2.20 and −2.93±2.50 for pre- and post-sessions, respectively, whereas those in the control experiment were −1.61±2.09 and −2.80±2.61, respectively. The repeated-measures ANOVA detected a significant interaction between experiment and session [F(1, 24) =4.709, p=0.040] (Figure 4C). Using the number of correct responses, a trend toward significant interaction between experiment and session was detected [F(1, 24) =3.496, p=0.074] (Table S1). Because there was a significant interaction, we calculated the variation in the Stroop interference score for the total response between post- and pre-sessions. They were −0.57±1.52 for the HA experiment and −1.19±1.72 for the control experiment. Statistical analysis revealed that the variation in the Stroop interference score in the HA experiment was significantly higher than that in the control experiment (p=0.040) (Figure 4D). In terms of correct responses, the variation in the HA group tended to be higher than that in the control group (p=0.074) (Figure S1). In terms of the Stroop interference score for oxy-Hb signals, a trend toward significant interaction between experiment and session was revealed in R-VLPFC [F(1, 24) =3.277, p=0.083], whereas there were no significant main effects [experiment, F(1, 24) =1.265, p=0.272; session, F(1, 24) =1.043, p=0.317 (Figure 5A and B)]. In R-VLPFC, the variation in the Stroop interference for oxy-Hb signals between post- and pre-sessions was calculated for both experimental conditions. They were 1.08±9.45 for the HA experiment and −4.07±10.88 for the control experiment. Variation in the Stroop interference score for oxy-Hb signals in R-VLPFC showed an increasing trend in the HA experiment compared with that in the control experiment (p=0.083) (Figure 5C). Details of the statistical analysis using a repeated-measures ANOVA are summarized in Table 1. Figure 5 Changes of the Stroop interference score for the oxy-Hb signals. Notes: (A) F-map of oxy-Hb signal change showing the interaction between experiment (HA/control) and session (pre/post) in six ROIs. (B) The Stroop interference score for R-VLPFC oxy-Hb signal. We subtracted the cortical hemodynamic change during the congruent condition from that during the incongruent condition. (C) The variation in the Stroop interference score for R-VLPFC oxy-Hb signal between post- and pre-sessions. F-map represents the F-value which obtained from statistical analysis as the color spectrum attaching brain figure. *p<0.1. Abbreviations: oxy-Hb, oxygenated hemoglobin; HA, housework activity; ROIs, regions of interest; R-, right; VLPFC, ventrolateral prefrontal cortex; DLPFC, dorsolateral prefrontal cortex; FPPFC, frontopolar prefrontal cortex. Note: Repeated-measures ANOVA with Bonferroni post hoc analysis: *p<0.1 and **p<0.05. Abbreviations: oxy-Hb, oxygenated hemoglobin; ROIs, regions of interest; HA, housework activity; R-, right; L-, left; FPPFC, frontopolar prefrontal cortex; VLPFC, ventrolateral prefrontal cortex; DLPFC, dorsolateral prefrontal cortex. We examined the effects of an acute bout of HA and physical activity on executive and cortical functions using SCWT and fNIRS, respectively. There was no significant difference between the two experiments with respect to the intensity of physical activity. The intensity was graded based upon the American College of Sports Medicine24 as follows: very light (<20% HRR), light (<20%–39% HRR), or moderate (<40%–59% HRR). The intensity of physical activity during both experiments was much lower than light, almost to the point of being classified as “very light”. The World Health Organization (WHO) recommends that adults aged ≥65 years should perform at least 150 min of moderate intensity physical activity throughout the week.38 Hence, the intensity of physical activity during the experiments in this study appeared to be a small portion of the daily recommended physical activity level. Both experiments decreased the Stroop interference score during SCWT (Figure 4C). MacLeod40 reported on “practice effects” in which the performance improved upon repeating the Stroop task. Three-way ANOVA detected the interaction between the task and session, suggesting that “practice effects” differently influenced congruent and incongruent tasks. Practice effects actually improved the performance in the congruent task to a greater extent than that in the incongruent task (Figure 4A). We defined the Stroop interference score as a deduction in performance scores of the incongruent task with those of the congruent task. Hence, practice effects decreased the Stroop interference score. Both experiments were conducted in the same manner so that a practice effect would equally affect the Stroop interference score. Hence, we analyzed the effects of HA on executive function using the variation in the Stroop interference score between pre- and post-sessions. Better performance in executive function requires more blood flow. 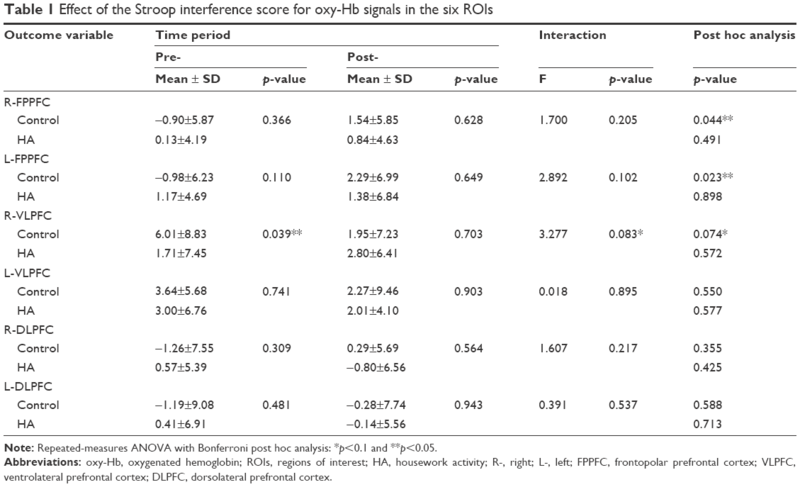 A reduced blood flow to the frontal lobe is associated with poor executive and memory functions.43 Variation in the Stroop interference score for oxy-Hb in R-VLPFC between post- and pre-sessions was higher with the HA experiment (Figure 5B). This trend coincides with the variation in the Stroop interference score during SCWT (Figure 4C). Stimulation of R-VLPFC may be related to executive functions. Although further investigation is needed, some studies provide clues to understand the underlying neurological mechanisms of beneficial effects of HAs. Rat models have shown that very light intensity walking increases the release of acetylcholine in the cerebral cortex.44 It is well known that cholinergic enhancement positively affects cognitive functions, whereas it has paradoxical influences on cerebral blood flow. Six months of donepezil therapy, a cholinesterase inhibitor, restores cerebral blood flow in the posterior cingulate cortex in patients with mild Alzheimer’s disease. Changes in cognitive scores significantly correlate with cerebral blood flow change.45 The administration of another cholinesterase inhibitor, physostigmine, improves working memory and reduces cerebral blood flow in PFC of healthy young people.46 The relationship between a cholinergic system and HAs should be further investigated. In our study, HAs had a purpose, which contrasts with control activities that had no underlying purpose. The simple control tasks of performing the motion require only a low level of skill, which can lead to boredom and a decrease in attention performance.47,48 Conversely, the subjective situation of the fit between abilities and task demands may facilitate improvement in attention.49 All participants reported a sense of accomplishment, although the questionnaire was conducted only in the HA experiments. Positive emotions including a sense of accomplishment lead to broadening of the scope of attention and improvement in the performance of the task.50,51 Positive emotions lead to a stimulation of the ventral tegmental area, where dopaminergic neurons are located, and project to various brain regions, including the nucleus accumbens (NAcc), PFC, and anterior cingulate cortex (ACC).52 Dopamine release at NAcc is crucial for the reward system, whereas dopamine at PFC and ACC contributes to cognitive function by modulating neural activity at these regions.53 The lateral orbitofrontal cortex, which is located in VLPFC, functionally connects to ACC and NAcc.54 Hence, positive emotions may influence the blood flow in R-VLPFC. Pesce has stated that future research should investigate the qualitative exercise characteristics that can promote improvement in the executive function.55 To the best of our knowledge, the present study is one of the first to provide evidence that HAs induce a greater beneficial effect on cognitive function than simple physical activity. We suggest that HAs are applicable to inactive people and are easier to execute repeatedly in everyday life. This study has some limitations. First, we investigated only healthy young adults with good prefrontal functions. Further investigation is needed to confirm the efficacy of HAs on the aging population. Second, executive function was measured using SCWT, which suggested a subtle difference between the two experimental conditions. Neuropsychological measurements such as the Tower of London test and n-back task could be more applicable than SCWT because HAs require working memory and the ability to plan for goal-directed behavior. Third, we provided the same instruction and execution contents to the participants of the HA group to control the cognitive workload; however, we could not confirm whether the workload amount was controlled. Fourth, in this study, continuously tapping affected brain activation during both tasks and it may not have been enough to exclude skin blood flow signals from the fNIRS signals. Finally, because of the characteristics of HAs, the SD of %HRR was high. It is difficult to adjust the intensity of HAs, unlike that of physical activities performed on an ergometer or a treadmill. Although the variable is maximal HR, the SD of previous studies was also high,16,17 like in our research. The authors wish to thank all colleagues who contributed to the present study. Chang YK, Labban JD, Gapin JI, Etnier JL. The effects of acute exercise on cognitive performance: a meta-analysis. Brain Res. 2012;1453:87–101. Yanagisawa H, Dan I, Tsuzuki D, Kato M, Okamoto M, Kyutoku Y, Soya H. Acute moderate exercise elicits increased dorsolateral prefrontal activation and improves cognitive performance with Stroop test. Neuroimage. 2010;50(4):1702–1710. Hogervorst E, Riedel W, Jeukendrup A, Jolles J. Cognitive performance after strenuous physical exercise. Percept Mot Skills. 1996;83(2):479–488. MacLeod CM. Half a century of research on the Stroop effect: an integrative review. Psychol Bull. 1991;109(2):163–203. Stroop J. Studies of interference in serial verbal reactions. J Exp Psychol. 1935;18:643–662. Byun K, Hyodo K, Suwabe K, et al. Positive effect of acute mild exercise on executive function via arousal-related prefrontal activations: an fNIRS study. Neuroimage. 2014;98:336–345. McMorris T, Sproule J, Turner A, Hale BJ. Acute, intermediate intensity exercise, and speed and accuracy in working memory tasks: a meta-analytical comparison of effects. Physiol Behav. 2011;102(3–4):421–428. Koizumi H, Yamamoto T, Maki A, et al. Optical topography: practical problems and new applications. Appl Opt. 2003;42(16):3054–3062. Obrig H, Villringer A. Beyond the visible – imaging the human brain with light. J Cereb Blood Flow Metab. 2003;23(1):1–18. Villringer A, Chance B. Non-invasive optical spectroscopy and imaging of human brain function. Trends Neurosci. 1997;20(10):435–442. Makizako H, Doi T, Shimada H, et al. Relationship between going outdoors daily and activation of the prefrontal cortex during verbal fluency tasks (VFTs) among older adults: a near-infrared spectroscopy study. Arch Gerontol Geriatr. 2013;56(1):118–123. Dong L, Xiao R, Cai C, et al. Diet, lifestyle and cognitive function in old Chinese adults. Arch Gerontol Geriatr. 2016;63:36–42. Jiang C, Xu Y. The association between mild cognitive impairment and doing housework. Aging Ment Health. 2014;18(2):212–216. Yoshida D, Shimada H, Makizako H, et al. The relationship between atrophy of the medial temporal area and daily activities in older adults with mild cognitive impairment. Aging Clin Exp Res. 2012;24(5):423–429. Murphy MH, Donnelly P, Breslin G, Shibli S, Nevill AM. Does doing housework keep you healthy? The contribution of domestic physical activity to meeting current recommendations for health. BMC Public Health. 2013;13:966. Brooks AG, Withers RT, Gore CJ, Vogler AJ, Plummer J, Cormack J. Measurement and prediction of METs during household activities in 35- to 45-year-old females. Eur J Appl Physiol. 2004;91(5–6):638–648. Gunn SM, van der Ploeg GE, Withers RT, et al. Measurement and prediction of energy expenditure in males during household and garden tasks. Eur J Appl Physiol. 2004;91(1):61–70. Fredrickson BL. The role of positive emotions in positive psychology. The broaden-and-build theory of positive emotions. Am Psychol. 2001;56(3):218–226. Hart SJ, Green SR, Casp M, Belger A. Emotional priming effects during Stroop task performance. Neuroimage. 2010;49(3):2662–2670. Gray JR, Braver TS, Raichle ME. Integration of emotion and cognition in the lateral prefrontal cortex. Proc Natl Acad Sci U S A. 2002;99(6):4115–4120. Perlstein WM, Elbert T, Stenger VA. Dissociation in human prefrontal cortex of affective influences on working memory-related activity. Proc Natl Acad Sci U S A. 2002;99(3):1736–1741. Oldfield RC. The assessment and analysis of handedness: the Edinburgh inventory. Neuropsychologia. 1971;9(1):97–113. Wilson LC, Peebles KC, Hoye NA, et al. Resting heart rate variability and exercise capacity in Type 1 diabetes. Physiol Rep. 2017;5(8):e13248. American College of Sports Medicine. ACSM’s Guidelines for Exercise Testing and Prescription. 8th ed. Philadelphia: Lippincott Williams & Wilkins; 2010. Ehlis AC, Herrmann MJ, Wagener A, Fallgatter AJ. 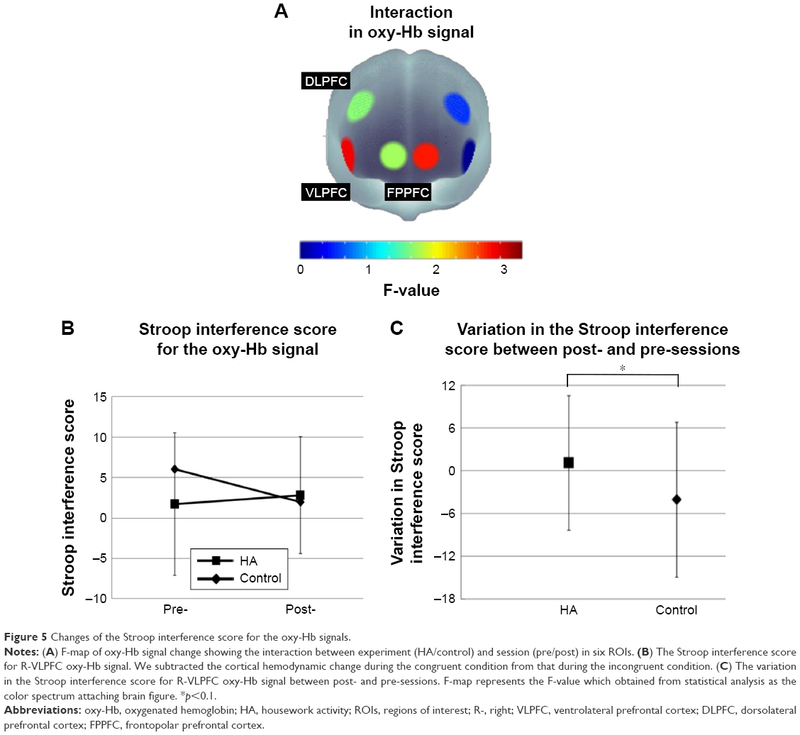 Multi-channel near-infrared spectroscopy detects specific inferior-frontal activation during incongruent Stroop trials. Biol Psychol. 2005;69(3):315–331. Delpy DT, Cope M, van der Zee P, Arridge S, Wray S, Wyatt J. Estimation of optical pathlength through tissue from direct time of flight measurement. Phys Med Biol. 1988;33(12):1433–1442. Hoshi Y, Kobayashi N, Tamura M. Interpretation of near-infrared spectroscopy signals: a study with a newly developed perfused rat brain model. J Appl Physiol (1985). 2001;90(5):1657–1662. Fan J, Flombaum JI, McCandliss BD, Thomas KM, Posner MI. Cognitive and brain consequences of conflict. Neuroimage. 2003;18(1):42–57. Mead LA, Mayer AR, Bobholz JA, Woodley SJ, Cunningham JM, Hammeke TA, Rao SM. 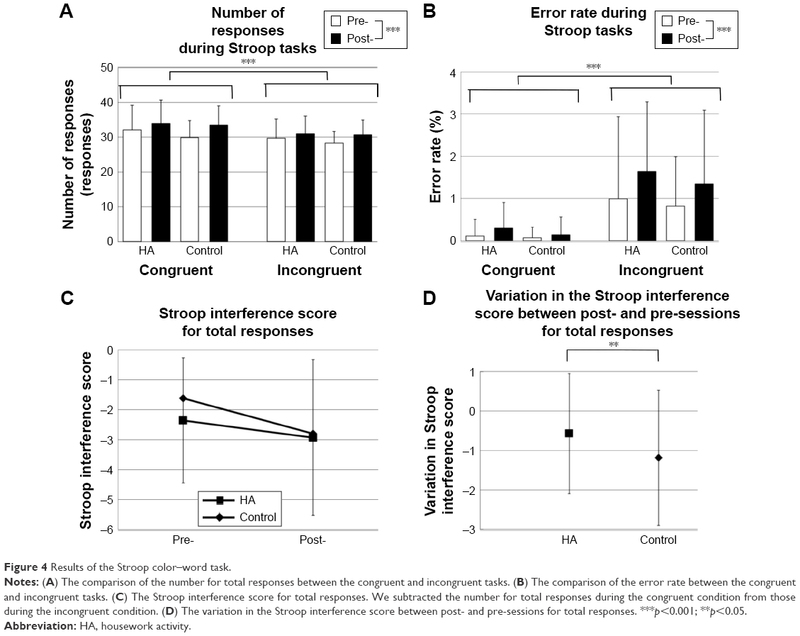 Neural basis of the Stroop interference task: response competition or selective attention? J Int Neuropsychol Soc. 2002;8(6):735–742. Leung HC, Skudlarski P, Gatenby JC, Peterson BS, Gore JC. An event-related functional MRI study of the stroop color word interference task. Cereb Cortex. 2000;10(6):552–560. Taylor SF, Kornblum S, Lauber EJ, Minoshima S, Koeppe RA. Isolation of specific interference processing in the Stroop task: PET activation studies. Neuroimage. 1997;6(2):81–92. Takahashi T, Takikawa Y, Kawagoe R, Shibuya S, Iwano T, Kitazawa S. Influence of skin blood flow on near-infrared spectroscopy signals measured on the forehead during a verbal fluency task. Neuroimage. 2011;57(3):991–1002. Takeda K, Gomi Y, Imai I, Shimoda N, Hiwatari M, Kato H. Shift of motor activation areas during recovery from hemiparesis after cerebral infarction: a longitudinal study with near-infrared spectroscopy. Neurosci Res. 2007;59(2):136–144. Singh AK, Okamoto M, Dan H, Jurcak V, Dan I. Spatial registration of multichannel multi-subject fNIRS data to MNI space without MRI. Neuroimage. 2005;27(4):842–851. Ye JC, Tak S, Jang KE, Jung J, Jang J. NIRS-SPM: statistical parametric mapping for near-infrared spectroscopy. Neuroimage. 2009;44(2):428–447. Langenecker SA, Nielson KA, Rao SM. fMRI of healthy older adults during Stroop interference. Neuroimage. 2004;21(1):192–200. Katagiri A, Dan I, Tuzuki D, et al. Mapping of optical pathlength of human adult head at multi-wavelengths in near infrared spectroscopy. Adv Exp Med Biol. 2010;662:205–212. World Health Organization. Global Recommendations on Physical Activity for Health. Geneva: World Health Organization; 2010. Derrfuss J, Brass M, Neumann J, von Cramon DY. Involvement of the inferior frontal junction in cognitive control: meta-analyses of switching and Stroop studies. Hum Brain Mapp. 2005;25(1):22–34. MacLeod CM. Training on integrated versus separated Stroop tasks: the progression of interference and facilitation. Mem Cognit. 1998;26(2):201–211. Watanabe Y, Sumitani S, Hosokawa M, Ohmori T. Prefrontal activation during two Japanese Stroop tasks revealed with multi-channel near-infrared spectroscopy. J Med Invest. 2015;62(1–2):51–55. Alosco ML, Spitznagel MB, Cohen R, et al. Decreased physical activity predicts cognitive dysfunction and reduced cerebral blood flow in heart failure. J Neurol Sci. 2014;339(1–2):169–175. Alosco ML, Gunstad J, Jerskey BA, et al. The adverse effects of reduced cerebral perfusion on cognition and brain structure in older adults with cardiovascular disease. Brain Behav. 2013;3(6):626–636. Kurosawa M, Okada K, Sato A, Uchida S. Extracellular release of acetylcholine, noradrenaline and serotonin increases in the cerebral cortex during walking in conscious rats. Neurosci Lett. 1993;161(1):73–76. Iizuka T, Kameyama M. Cholinergic enhancement increases regional cerebral blood flow to the posterior cingulate cortex in mild Alzheimer’s disease. Geriatr Gerontol Int. 2017;17(6):951–958. Furey ML, Pietrini P, Haxby JV, et al. Cholinergic stimulation alters performance and task-specific regional cerebral blood flow during working memory. Proc Natl Acad Sci U S A. 1997;94(12):6512–6516. Yoshida K, Sawamura D, Inagaki Y, Ogawa K, Ikoma K, Sakai S. Brain activity during the flow experience: a functional near-infrared spectroscopy study. Neurosci Lett. 2014;573:30–34. Hunter A, Eastwood JD. Does state boredom cause failures of attention? Examining the relations between trait boredom, state boredom, and sustained attention. Exp Brain Res. Epub 2016 Aug 10. Yoshida K, Sawamura D, Ogawa K, et al. Flow experience during attentional training improves cognitive functions in patients with traumatic brain injury: an exploratory case study. Hong Kong Journal of Occupational Therapy. 2014;24(2):81–87. Fredrickson BL, Branigan C. Positive emotions broaden the scope of attention and thought-action repertoires. Cogn Emot. 2005;19(3):313–332. Isen AM, Daubman KA, Nowicki GP. Positive affect facilitates creative problem solving. J Pers Soc Psychol. 1987;52(6):1122–1131. Ashby FG, Isen AM, Turken AU. A neuropsychological theory of positive affect and its influence on cognition. Psychol Rev. 1999;106(3):529–550. Clark KL, Noudoost B. The role of prefrontal catecholamines in attention and working memory. Front Neural Circuits. 2014;8:33. Berridge KC, Kringelbach ML. Pleasure systems in the brain. Neuron. 2015;86(3):646–664. Pesce C. Shifting the focus from quantitative to qualitative exercise characteristics in exercise and cognition research. J Sport Exerc Psychol. 2012;34(6):766–786. Notes: Repeated-measures ANOVA with Bonferroni post hoc analysis. *p<0.1, **p<0.05, ***p<0.01. Figure S1 Results of correct responses during the Stroop color–word task. Notes: (A) The Stroop interference score for correct responses. We subtracted the number of correct responses during the congruent condition from those during the incongruent condition. (B) The variation in the Stroop interference score between post- and pre-sessions for correct responses. *p<0.1.